Explaining computer science and IT topics can get quite complex. A good idea is to illustrate them with simple icons: whether you’re talking about Internet communication, data or various digital media types. This article is an overview of using IT icons we designed to help people communicate visually. However, the ideas here are general. Feel free to apply them as inspiration for any images you use. Why use one consistent IT icons set? An inconsistent look of images if you use several resources – one symbol is flat, another has gradients, the next one has a shadow. Unclear copyrights for using the icons from the Internet, e.g. author attribution is needed, or pictograms are only for non-commercial private use. With our infoDiagram IT devices icons set we address all those issues. Check the example slides below. 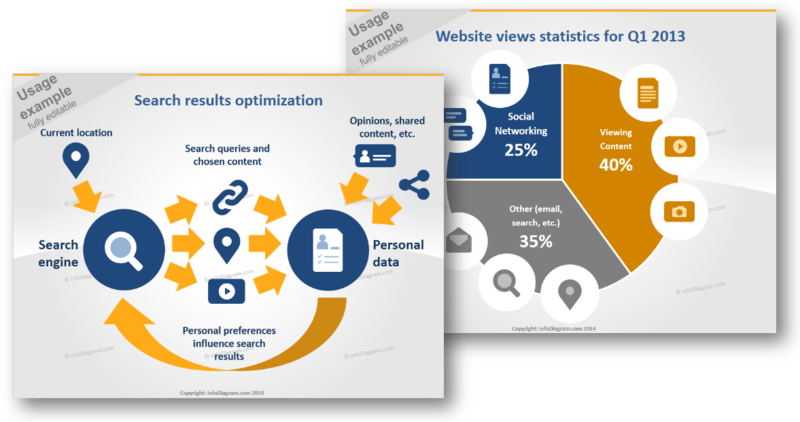 Adding a simple symbol over the data chart of flowchart diagram will help you to catch and keep the attention of your audience on the points you want. Especially if you present a complex issue. That way information gets visual and therefore easier to understand. E.g. 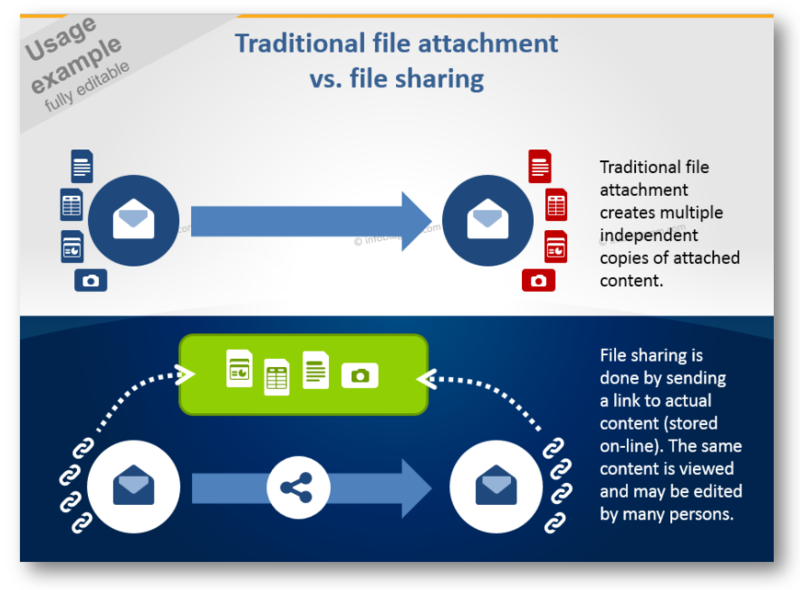 on the slide below we can see a comparison of traditional file attachment versus file sharing. If we used only text organized in bullet points, the concept would seem much more complicated. The slides in the set are already pre-designed, so you can use them as templates and just put in your information and numbers. Besides adding the icons to PowerPoint slide, you can use them also in other documents. It can be an e-book PDF file, Excel sheet or Word document. The visuals can be used also out of Microsoft Office – in Keynote, Prezi and other tools. For MS Office apps a simple copy & paste of the data chart or symbols will work. For other tools (Canva, Prezi..) saving icons as an image (click to see Slideshare tutorial) and adding them as a picture will do the work, too. What’s inside the File Types, Media, Web IT symbols set? The collection contains over 20 modern, flat symbols and means for designing visual diagrams. You can choose colors to correspond with your brand and the color scheme and layout of your presentation. All arrows and shapes are editable vector artwork so you can adjust them as needed, using standard PowerPoint tools. And they remain razor sharp also if you resize them, unlike bitmap pictures. All icons are in simple flat style, suitable for Metro UI style graphics. Symbols provided in 4 versions: for a light background, dark background, standalone, in a circle. 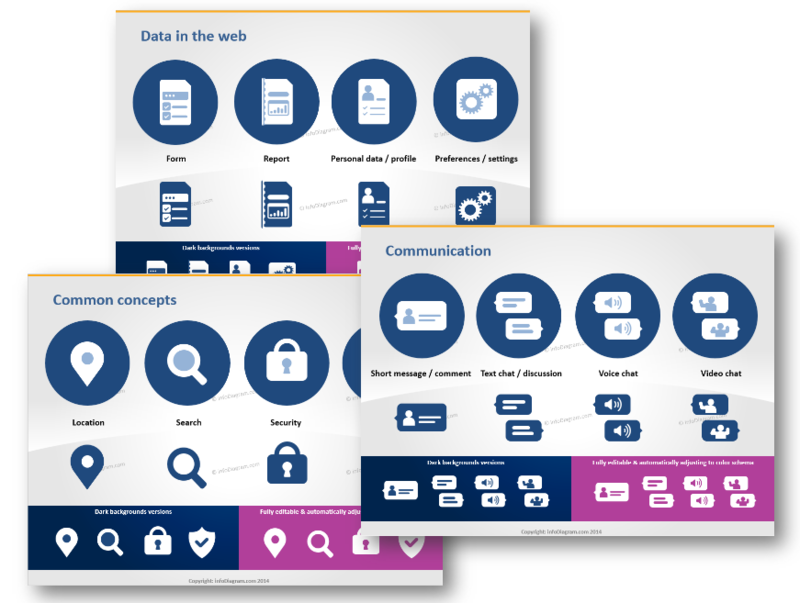 Icons and chart examples above are from our infoDiagram PowerPoint Diagrams collection. 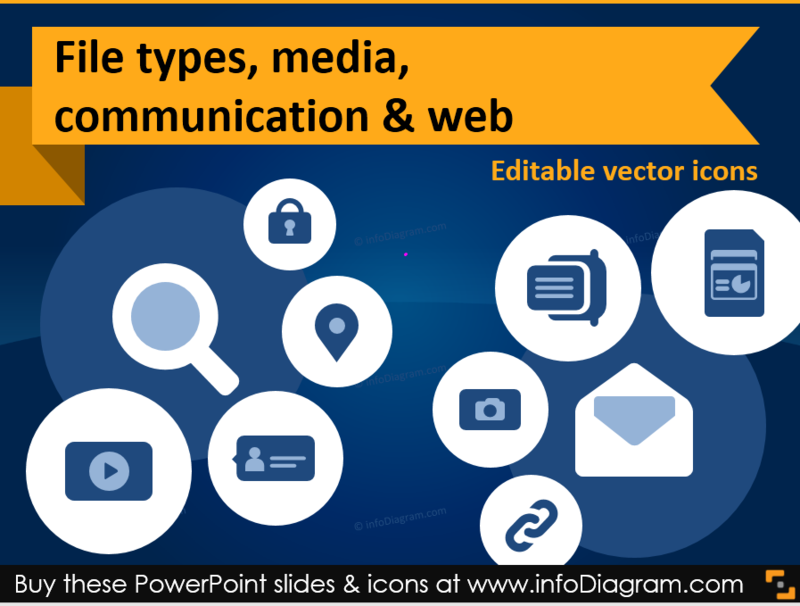 It contains editable graphical elements for PowerPoint on IT-specific topics, which can be easily edited and added to other presentation. This icon set is a part of wider IT Icons Presentation Bundle, which contains pictograms and diagrams for various information technology concepts.